CORTE MADERA, Calif.--(BUSINESS WIRE)--Apr. 12, 2017-- RH (NYSE:RH) announced today the debut of the 2017 RH Outdoor Source Book. At more than 300 pages, this design resource presents the most comprehensive collection of quality outdoor furniture in the world. Chairman and CEO Gary Friedman has tapped some of the most renowned global designers to develop and showcase their work on the RH platform. This season introduces a new collaboration with esteemed designer Clodagh, whose eponymous collection translates a contemporary metal chair she designed for the indoors into an outdoor silhouette, reimagining hand-woven resin to achieve the striking appearance of bronze. Reflecting the centuries-old art of basketry, the intricate weave creates a bold, open lattice, while the warm finish lends the look of burnished metal to its low, linear forms. Louis Ho’s Havana Collection mixes contrasting materials for a modern, minimalist take on outdoor furniture. Distinguished by clean lines and graceful curves, the collection is crafted with vertical all-weather wicker cording that creates a dramatic interplay of light and shadow, while the airy frame is grounded by a teak base. The new assortment includes Barlas Baylar’s first-ever collection for outdoor living. Inspired by his summers in Mykonos, the Aviara Collection is crafted of premium teak and spans both lounge and dining. Aviara’s linear, framed openings create a modern architectural form, while the design’s perfect proportions and ample cushions provide a refined counterpoint. Ann Marie Vering’s Milano Collection features a bold T-back silhouette crafted of weathered, sustainably harvested premium teak. The highly structured geometric collection – which spans lounge seating and occasional pieces – features clean lines and a low platform base influenced by 1960s modernism. RH’s continued collaboration with Australian brothers Nicholas and Harrison Condos yields two new collections this season. Celebrating the relaxed sophistication of Sydney’s seaside, Marea is fashioned from hand-wrapped, heathered all-weather rope, creating a dramatic linear silhouette. And with its sleek form and accessible scale, Palma offers contemporary seating and dining pieces handcrafted in double powdercoated aluminum. Other highlights include the Nido chair, an oversized, organically-shaped statement piece rendered in enduring all-weather wicker that pays homage to 1970s design; the Massimo Collection, featuring broad teak planks with a distinct inset panel design, echoing the architectural inspiration of Mies van der Rohe; and the modern Marbella Collection in teak and aluminum – now available in five modular pieces with ultra-deep seats for endless configuration possibilities and maximum comfort. Distinctive accents include Jonathan Browning’s geometric, powdercoated cast aluminum Toulon lanterns; handcrafted Toluca fire tables made from reinforced concrete in a natural limestone finish; sleek fiberglass planters in grey and onyx; and textured fiberstone planters in both cubist and organic forms by Mitch Brean. Global-inspired textiles include RH’s African Mud Cloth pillow cover collection and Kerry Joyce’s modern interpretation of Javanese batik– each jacquard-loomed of enduring Sunbrella® fabric – as well as designer Ben Soleimani’s high-performance rugs, which are masterfully hand woven from the finest all-weather yarns to achieve the rich texture and natural feel of wool, for indoors or out. 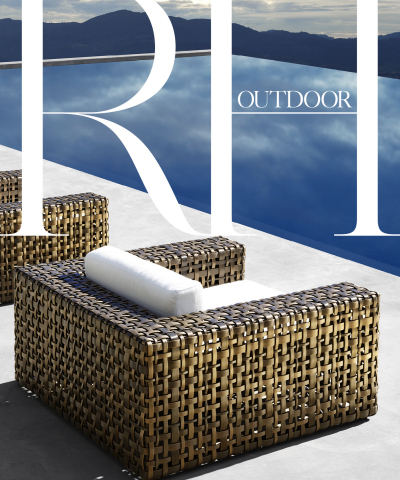 For more on RH Outdoor, visit RH.com or RHModern.com. RH (NYSE:RH) is a curator of design, taste and style in the luxury lifestyle market. The Company offers collections through its retail galleries, source books and online at RH.com, RHModern.com and Waterworks.com. This release contains forward-looking statements within the meaning of the federal securities laws, including statements related to RH’s quest to unite and integrate the ideas of the most talented people in the industry, continuing to push established boundaries and shaping the future of design. You can identify forward-looking statements by the fact that they do not relate strictly to historical or current facts. We cannot assure you that future developments affecting us will be those that we have anticipated. Important risks and uncertainties that could cause actual results to differ materially from our expectations include, among others, risks related to the number of new business initiatives we are undertaking; our ability to introduce new products and merchandise categories that will be of interest to our customers and to new customers; as well as those risks and uncertainties disclosed under the sections entitled “Risk Factors” and “Management’s Discussion and Analysis of Financial Condition and Results of Operations” in RH’s most recently filed Annual Report on Form 10-K filed with the Securities and Exchange Commission, and similar disclosures in subsequent reports filed with the SEC, which are available on our investor relations website at ir.restorationhardware.com and on the SEC website at www.sec.gov. Any forward-looking statement made by us in this press release speaks only as of the date on which we make it. We undertake no obligation to publicly update any forward-looking statement, whether as a result of new information, future developments or otherwise, except as may be required by any applicable securities laws.